Fatherless Jack and Phoebe are completely non-identical twins. Jack's so vague he has daydreams within daydreams. He dreams he's a Conductoid. Beings from other dimensions can only use their powers on earth through him. But the days for dreaming are over. Just ask Jack's teachers. Don't they know lives will be lost? For the difference between the "impossible" and the "possible" is but two small letters. And as for Phoebe, well, the twins are completely non-identical. I am always looking for books I can read with my kids and this is one of them We read often as a family and I need it to be something for Spring break they will both be into but also one I won't hate reading again. M.B. Lehane combines every category I look for when selecting a family read; fantasy, adventure, humor, friendship, and great characters. I enjoy reading a book before my kids so I can build on it as we read. I am excited to see what my kids think about Conductoid. Conductoid is about a brother and sister much like my kids and while my kids are not twins like Jack and Phoebe they are completely different. From the first page you are thrust into the daydream world with Jack. He can't help himself. Jack is amazing in his dreams. Always the super hero and always saves the day. He even has a ceiling that rolls back so he can jet pack out of his bedroom anytime he is needed to save the world. Staying in reality isn't easy for Jack and why would he want to. He is constantly bullied, his mom doesn't seem to understand him. He and his sister don't get along and he is constantly in detention but what if Jack really is all he imagines. What if he is magical in other dimensions? What if he actually has powers. The story isn't just about Jack and his specialty it is about family, trust, loyalty, perseverance and the secondary characters are just as important to the story too! I love Phoebe and Skye. 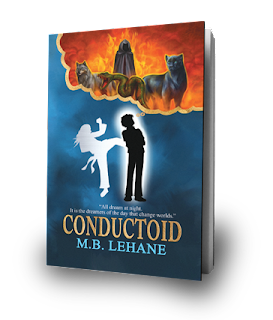 Like all the books this is being compared to; Harry Potter, Charlie and the Chocolate Factory, Percy Jackson, even Lemony Snicket (not a bad book in the bunch) Conductoid is also a great read for a boy or girl. Head over to the Conductoid website and read Chapter 1 for yourself.